Siyapatha Finance PLC celebrated the dawn of 2019 with the opening of a brand new branch in Piliyandala. This marks the 31st branch in the leading financial organization’s island-wide network. The new branch is located at No. 88 along the Moratuwa road in Piliyandala. Dr. Dilanjan Soysa, the Non-Executive Director of Siyapatha Finance, attended the opening ceremony as the chief guest along with Mr. Saman Herath, the Managing Director of Siyapatha Finance PLC, and other senior members of the organization as well as distinguished invitees. 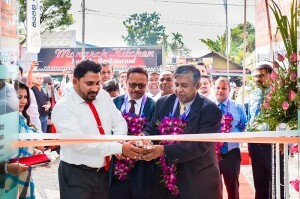 “Opening a new branch in Piliyandala is a crucial move in our expansion strategy, as Piliyandala is fast-developing suburb with a large population. Thanks to the new branch we are in a position to increase our reach, and to serve a larger number of present and future customers. Being a subsidiary of the Sampath Bank Group we are a stable organization, having adopted the best practices of our parent company. Our customers can rest assured that we have their best interests at heart and that we work hard to deliver a high standard of service at all times”, said Mr. Saman Herath, the Managing Director of Siyapatha Finance.